Trees can often elicit strong emotions. Maybe you climbed your favourite tree as a youth. Maybe there are names carved into the bark from a past love. Maybe you just like the way a tree looks and don't want to part with it. As improbable as it sounds, moving doesn't mean that you have to say goodbye to your favourite tree. It is possible to move a tree with you and plant it outside of your new home. Tree movers are a type of specialty mover that primarily focuses on transporting big plants like trees. They are more likely landscape architects than typical movers. The tools and expertise needed for moving a tree are very specific, so it unlikely that you will find tree moving services included in a conventional moving company's repertoire. To find a tree mover in your area, it is best to use a general search engine like Google and specify your area. Remember to treat whatever companies you come in contact with like you would any moving company, and ask for estimates early and often. It is important that you find the best deal on your tree mover. The fact that tree moving companies are able to specialize so much can give you a clue about how expensive this process really is. Transplanting a large tree and providing follow-up visits and treatments to ensure the health of the tree after its transplant can cost nearly $60,000. That is just for one large tree. On site inspection: The first thing a tree mover will do is inspect your tree. They need to consider if the job is even possible or if they may need to consult with anyone in order to get the job done. Some tree species are more resilient than others, and some positions of trees are more difficult to excavate around than others. These factors inform the mover's estimate for the project or it may even turn him off from the job altogether if he deems it impossible. 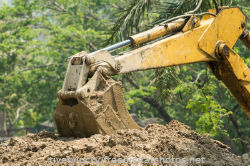 Dig a hole: Once the mover decides to go ahead with moving the tree, he will need to view the target area and choose a good spot for the new tree. If a suitable spot is found, they will dig an appropriately sized hole there. Dig out the root ball: A root ball is the cluster of underground roots that a tree uses for sustenance and includes the dirt immediately surrounding them. Tree movers need to find this ball unearth it intact so that the tree can be freely moved without harming it. Sometimes "tap-roots" will be used. They are a handful of roots from the tree that are still underground while the rest have been gathered and bound in the root ball. Sometimes a tree is left in this transition period for weeks in order for it to get acclimated to being dug up before it is moved. Lifting the tree: Some trees can be lifted using a tree spade. These large, hydraulically-powered bladed machines can pull a tree out of the ground. The spade attaches to the tree and can be loaded on a truck. Sometimes a crane is used to life the tree, as well. Transport: Trees can only be moved domestically with almost no exceptions. Trees are secured on the backs of open trucks, either clamped in a tree spade or secured by some other means after being lifted by crane. The tree needs to be in an open air trailer in order to receive sunlight. Planting: Once the tree is at the destination, it is lowered into the hole. A Tree Spade can release it's grip once the tree is in place. 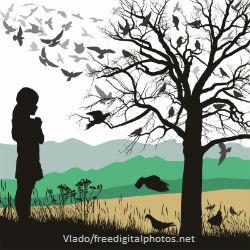 Crane-carried trees involve a little more trial and error, but the idea is the same. Once the tree is in place, dirt is filled in around it, securing the tree in the ground. Tree moving is a time consuming and expensive process. But trees are beautiful and can live much longer than an average person. For some tree-lovers, the ability to bring a great tree with them to their new home is worth any price.